The Calgary Stampeders play the Montreal Alouettes for the CFL Grey Cup Championship on Sunday. Being from Calgary, of course I’m cheering for the Stamps. However, I am a bit disappointed at how our quarterback, Henry Burris, reacted after not being voted as the league’s Most Outstanding Player. He did his fair share of whining and complaining about how his team (really he) fails to get respect and recognition. But, ironically, when using that ‘we were robbed and disrespect’ card of not coming out on top of any awards as motivation, this method may backfire and be a reason that critics will use back against them if the Stamps should lose. In this case, I would agree with the critics. Leading up to this week, as well as at beginning of playoffs, Burris and his loud mouth kept emphasizing how most important is the team award and the Grey Cup at the end of the road. So why is more noise being made about these outstanding player awards? If you really want to make a statement, and prove to everyone that you were ‘wronged’, then just shut up, stay quiet, have an amazing game Sunday, and then talk all you want after. Actually, you wouldn’t even have to talk, because the results would speak for themselves and everyone would realize how they overlooked the Stamps and would then respect them even more for just focusing on the team goal. Wouldn’t this be an even more powerful statement than trying to yell it in everyone’s ear? Just from a glimpse at some of the fan reaction, even a lot of Stamps fans are embarrassed by the comments Burris made. He is representing the city in a way that I think most of us do not want to be portrayed. And if we must count, Burris has won one playoff game with the Stamps so far, and he did not have anywhere close to the ‘definitive’ game, as it was more Calgary’s defense and special teams that kept them in it. What about the other years when his turnovers cost the Stamps in the playoffs? Was he voted off the island? Least most valuable? Some may have had their gripes inside, but I don’t think many players would publicly announce how bad he played. So, now that things are turning around, I don’t think there’s any need to announce how good you are…or how good you want people to say that you are. You barely squeaked by BC, and the way you are talking makes it sound like because you beat BC…and topped the West, and that the West is the tougher division this season, and you beat all the teams in the West throughout the year, that should give you the MVP award? All this noise before playing the Grey Cup? It’s like Burris already assumes, and is saying it loudly in his whines, that they are the better team just because they are from the West, and Montreal is not as deserving cause they play in the East? Maybe Montreal should be the ones feeling a lack of respect, and not so much Burris! I know it’s more of a psychological ploy to create an ‘us versus the world’ mentality, but the story does not need to drag on. Again, if it ends up working, and Burris has the game of his life, good for him. And I’ll celebrate the Stamps’ great achievement, but will still wonder about the priorities of Henry Burris. He’ll always have that asterisk beside his smile. There is nothing like going through a fantasy football draft. Talk about a tool, a game, that can exacerbate your procrastination into depths inescapable. I go into every year promising myself not to spend too much time, not to get too caught up, and just to make picks quickly without too much thinking, but I inevitably fail. For me, it’s not actually my own pick that is the time-consuming and mind-distracting problem. It’s the emotional up and downs of receiving emails concerning all the picks made by others. The sound effects are incredible! More often than not I make excruciating sounds when a player is chosen whom I’ve been coveting and hoping would fall to my draft position. But every odd time, I feel utter elation when a player is chosen who isn’t even on my radar or entire cheatsheet list! It’s just a game, but how can something so seemingly simple as selection make us feel so all over the place in our attraction to it? Is it because we finally get a feeling of being the selector rather than the selected, and enjoy the psychological change in perspective? Can Darwin help in this kind of selection? It finally happened. It had to. I’ve been playing with fire for way too long now. And I got burned. In an effort to save, or out of pure laziness, or perhaps due to a lack of trust, I simply have been refusing to buy one of those armband wraps for my iPod nano (the version minus the video function). It’s pretty small, fits easily into my pocket, and maybe I just fear that the armband will lack fortitude during my most intense workouts, as I imagine my dear iPod nano somersaulting into the air while my hands are too occupied with free weights to catch the falling victim. Smash, thud, soundless. So, the supposedly safe haven of my pockets continued to be its home. And this was the case a few days ago when I mowed my lawn, pumping out the tunes to make arduous work in the afternoon sun more enjoyable. The tunes did its job, as I had energy left over to spot treat some weeds, and also apply fertilizer to other areas. When I came back into the home, I wasted no time stripping right by the door, as I didn’t want the gardening chemicals and odors to inundate the furniture and my sleeping domain. Strip, clothes right into the laundry, add some other dirty clothes, turn on the washer, go shower, go to iTunes and download some more motivating material for the next physical session. That’s my routine, and that’s what I did. Yes, something went terribly wrong, and you may already be able to guess. Hours later, after dinner, I was ready to sync iTunes with my iPod when an almost swear word came out of my mouth. Where the $$$$ was my iPod? I practically jumped down the entire flight of stairs and rushed to the laundry room. No sound. It was done. I opened the door nervously and dug out my wet sweatpants. So clean, no stains. There was a lump in the left pocket. 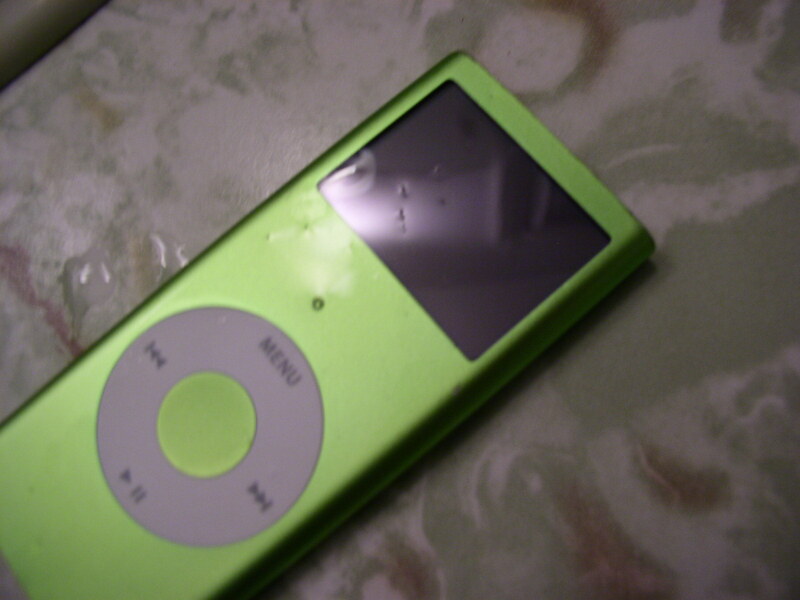 I dug out my iPod nano. So clean, no stains. But with some soap bubbles underneath the screen when I pushed against it. Take a look at my shiny iPod below. iPod taken to the cleaners. Soundless. The washer cleaned the music right out of it. If there’s any consolation, the headphones still work. After a day of mourning, and needing music for my workouts, I decided to get the iPod Touch. With video options, and wireless capabilities, perhaps it can give an even bigger boost to exercise and other activities. I guess I’m stubborn because even though just fresh off learning a very expensive and painful lesson from having me and my iPod taken to the cleaners, I of course ended up stuffing the iPod Touch in where else but my left pocket. And this time I even bought the armband, but….you know…..
No worries. The iPod Touch is much more bulkier and hefty, and the protrusion in my pants is noticeably bigger, making it less likely that I’ll again absentmindedly overlook it. With this new toy, I just had to try out some of the new features at the gym. My gym has wireless access, so I wanted to see if I could link to the Internet, go to YouTube, look up some speed training videos, and pick up some tips to use right away. Unfortunately, searching is quite the pain as the touch screen keyboard is not the most user-friendly. My fingers are not the biggest, but each press seems to be only a 50/50 chance of hitting the desirable letter. I’m sure it should get a little more efficient the more I do it but, at the gym, I started to lose the sweat and gains from my warm up while poking at the iPod screen. Perhaps the videos, and instructions, would be better used before entering the gym, and I should stick with only music during the workouts. Anyways, I couldn’t resist the novelty and I guess I had to justify making an expensive purchase by using it every chance I had. When I got home, I had an idea. Wouldn’t using a stylus make for easier and less error prone use of the screen keyboard? 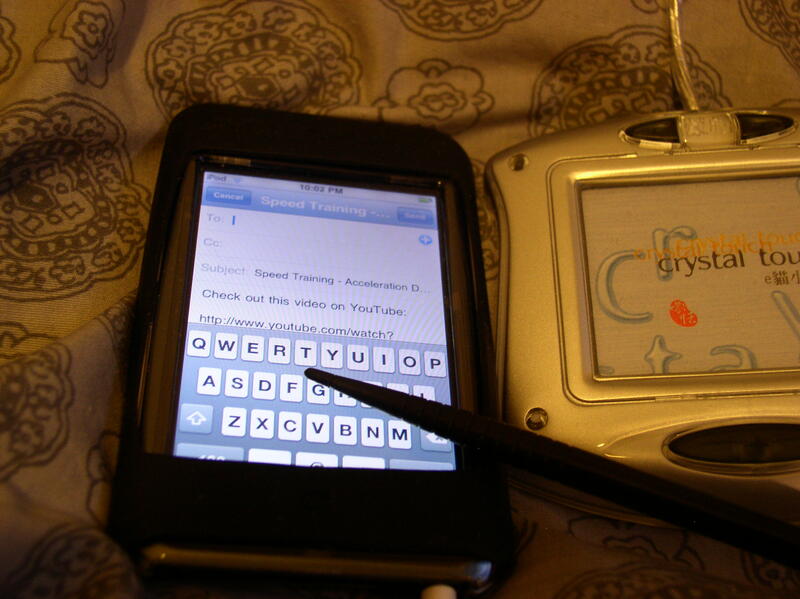 I took the screen writing pen from a Chinese language inputting device and tried it with the iPod Touch anticipating an increase in efficiency. See the picture below. Wouldn’t a Stylus Make Sense? Alas, it didn’t work, no matter how hard I pushed. I know the iPod touch is not really meant for work purposes, but if part of the reason for its higher price tag is wireless access, then it probably needs a better keyboard device to facilitate web browsing. Is the iPhone better in this regard? I don’t know and I don’t plan to find out through personal direct use because this iPod touch will not be going in the wash! Is it the Left Side Improving or is it the Right Side Declining? While some of the other short cuts posted so far may be humorous and amusing, I find this one hard to laugh at. In fact, it straight out hurts. Time saving may be a worthwhile pursuit but sometimes taking the quick way actually results in short cutting life itself. This realization hit me hard during my workout this morning. While I have pretty much fully recovered from my left knee surgery well over a year ago, the left leg is still not quite as strong or as big as the right leg. Even though I’m back at sports and doing most activities without restraints, I still have to remind myself to put some extra work on my left side in the weight room so it can eventually catch up, and I can be more balanced with less compensation overall. This, of course, will improve overall performance, health, and reduce risk of further injury. It’s been a long, arduous process. Often, while in the middle of a set, I hear myself saying out loud “Come on Left!” to give myself some extra motivation and a reminder to focus in on the weakness. No doubt, after all this time, the left has gained in both strength and size. However, it seems that no matter how hard I work, it’s still trailing behind my dominant right. Frustration started to set in and I found myself taking a short cut. In essence, I lowered the bar. The right side was already doing less reps than the left, but now these reps lost their quality as well. I was almost going through the motions and even caught myself saying just before commencing a set on the right: “Okay, now for just a few quick token reps on the right.” It’s almost as if I’m trying to weaken my right side to make it easier for my left side to catch up! This is sort of like saying one side won because the other side purposely gave up and allowed it. This short cut is a real punch in the gut for me and a wake up call. It offers a very temporary easy victory, but these kind of shallow victories hurt more than losing in an honest and real fight. Come on left! The right side is not going to pretend anymore. I know that the Pittsburgh Penguins just lost the Stanley Cup to Detroit, but just wanted to post a quick, brief message congratulating them on their accomplishments and helping me rediscover some of my own passion for the game and sport in general. Their youthful energy, playfulness, and sense of naivety gives motivation for all of us to sometimes just immerse whole-heartily and trial by fire, trial by error, and laugh and learn along the way without fearing mistakes. Remember in Game 1 when Marc-Andre Fleury, the goaltender, tripped upon entering the ice? His nervousness is emblematic of all our nervousness, but that it’s okay to laugh and know we all have fallen on the biggest of stages. And that it is the same game we’ve always played throughout our lives and to never forget the joys and reasons why we play in the first place. Click Here to See Marc-Andre Fleury’s Falling Entrance! Click Here to See Sidney Crosby Falling When Young! Below is another more close in angle of the Fleury fall. So, it’s anticipated that Ron Wilson, former San Jose Sharks’ coach, will take control of the Toronto Maple Leafs. No doubt he is a fine coach who just couldn’t quite get the Sharks over the last hurdle to the Stanley Cup. However, there may be more than a few of us who are wondering aloud if it’s the right fit. Mr. Ron Wilson. That question to you when you were a Sharks’ coach will seem like grade school compared to the onslaught you are going to receive from the Toronto media!